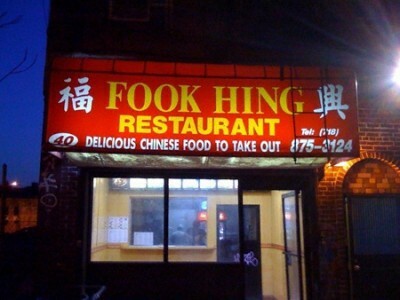 I don’t know about you, but I’ve noticed more Fook Hing Chinese restaurants opening in my neighborhood. I wonder what that says about my neighborhood? Look for another delicious post tomorrow. It was my turn to pick next and about a month after we visited La Fonda Boricua, I came up with my choice by “word of mouth.” One of my son’s pre-school teachers was Guyanese. I asked her for a place where I could find authentic Guyanese food. I was familiar with some items having traveled to the Caribbean extensively and, in particular, the islands of Grenada and Trinidad and Tobago which, like Guyana, featured a blend of people and influences from the Caribbean, Africa, China, East India, and indigenous peoples. I knew and tasted roti and pepper pot, both Guyanese specialties, but beyond that not much. And as far as I knew at the time, there were no Guyanese restaurants in Manhattan and few, if any, in the outer boroughs as well. At first my son’s teacher was evasive; she was curious why I would consider traveling outside of Manhattan for Guyanese food. But I mentioned my search for good pepper pot in the city and that impressed her. Finally, she steered me to Atlantic Bamboo Garden in Richmond Hill Queens. It was dark on Atlantic Avenue. So dark it was hard to distinguish one chop shop from the other. The rain was erratic; on and off, just like Zio’s windshield wipers. But there it was. Set a bit off the street. The colored lights advertising “Bamboo Garden” inviting on such a raw, dreary night. It was like something out of a Scorsese movie. To be more accurate, out of Good Fellas. Was it the place that was torched by the Wise Guys of the movie made out of the book of the same name? That was the opening debate as we convened for our second food adventure. The next debate was whether Eugene’s tropical fruit milkshake was actually a milk of magnesia shake? Eugene, we are still waiting for your answer. Gerry and I immediately took care of the inclement weather outside by ordering rum punches G/T style. Whatever the style, the rum was very punchy and if I hadn’t been so concerned about Zio’s aged eyesight along with his shaky windshield wipers, I too would have gone for another round as Gerry bravely did. After complaints about under ordering at La Fonda Boricua, we over compensated by ordering three appetizers. By the time we finished off the garlic pork, jerk chicken, and fried shark, G/T Style (G/T explained as Georgetown, the capital city of Guyana), Bamboo Gardens was filling up with parties of extended Guyanese families. A mix of soca, R&B, Caribbean Chutney (Indian), and reggae was playing on the sound system. The place advertised itself as the No. 1 West Indian style cooking and Guyanese-Style Chinese food. We couldn’t vouch for it being No. 1, but none of us had ever had Guyanese-Style Chinese food before, so in our limited food experiences it was the one and only. Maybe pepper shrimp fried rice, which I sampled, distinguished this Chinese food from, say, Cuban-Chinese food. Or maybe it was the snapper in coconut milk sauce, which Eugene devoured, that made it different. Rick thought it was the fact that Bamboo Garden was the first and only Chinese restaurant he had ever eaten where there was a total absence of Chinese people either working or eating at the restaurant that was the real difference. Once the various and hearty West Indian and Guyanese-Chinese courses were polished off, only Zio and I dared dessert. Zio, trying to recreate the red jello* experience, ordered that Guyanese specialty, cheesecake, while I tried the soursop ice cream. Neither were the equal of what we had eaten in our first two courses. . .and it was that cheesecake, I believe, that pushed us slightly over the $20 mark. The rain had stopped by the time we left Bamboo Garden. We could see the facade of the restaurant more clearly now. 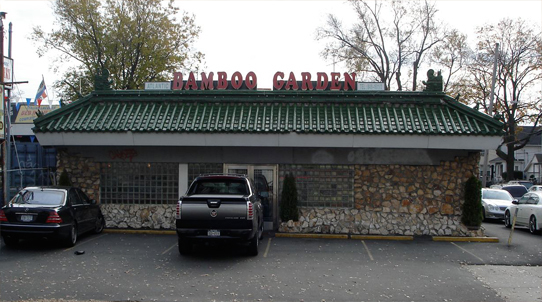 No, the consensus on hand believed it probably wasn’t the same Bamboo Garden from Good Fellas. But the consensus also believed it was worth the trip to Richmond Hill Queens to try Guyanese-Chinese food. *For those who do not know, Zio is famous for an eating experience at the Court Deli, near Yankee Stadium. The Court Deli is a popular pre-Yankee game restaurant and known for their succulent Kosher hot dogs, pastrami, corned beef and other deli items. Zio, however, for one particular pre-game meal was, it seems, watching his waistline and instead of stuffing his face with the usual, two hot dogs and a knish, was found hunched over a plate of cottage cheese and red jello. I can verify that he rectified that embarrassing moment by bringing two potato knish’s into the Stadium eating one in the third inning and then finishing off the other two innings later. In late 2001, I came up with the idea to gather together friends who, like me, enjoyed finding, out of the way, unusual, usually ethnic, usually cheap eats throughout New York. To add to the experience, I suggested that we meet together every month or six weeks with one of the members of the group picking the destination. I targeted friends, or friends of friends, who were uninhibited about their food choices; meaning they had to be open to any type of food, meat, fish, spicy, raw, whatever. Anyone whose diet had restrictions due to health, philosophical or religious reasons where red meat, pork, shellfish, entrails or any other food product were prohibited really could not participate. Thankfully, that did not stop any of my first choices. Eventually, our original group came to six men. Part of the loose criteria I came up with in my “proposal” for our group, was a $20 food limit per person, excluding beverages. So wherever we choose, it had to meet or come very close to that dollar amount. Also, I made it clear that we should steer clear of restaurants that had already been “discovered.” We wanted to find places that were under the radar; that had not yet been written up by Eric Asimov of the New York Times, the then “$25 and Under” column writer in the paper’s weekly Dining section, New York Magazine, or any other major publication. This was well before the internet explosion of food related websites like Chowhound, Grub Street, Eater, Serious Eats, and Yelp to name just some of the hundreds out there now discussing new restaurants including the type we were pursuing. The six men, who comprised the original group, leaving their last names out, were Charlie, Rick, Gerry, Eugene, Zio, and myself. The only change in the group over the almost nine years we have been doing this was the loss of Charlie, who moved a couple of hours outside of the city making his commute for our gatherings not very practical. He was replaced by a friend of Gerry’s we call, Mike from Yonkers. Since we began these expeditions, I chronicled each restaurant we visited with a sometimes brief, sometimes wordy summary of our experience at that restaurant. In this blog, I’m calling Fried Neck Bones…and some home fries, in honor of the Willie Bobo song of the same name, I will, at first, post many of the original blogs. Once readers familiarize themselves with the cast of characters involved and read about many of the places we have visited, I will add each new summary to this blog, hopefully with photos to enhance the written description I’ve provided. Feedback, of course, is encouraged as is any news on either many of our already visited destinations or new discoveries we might want to visit. 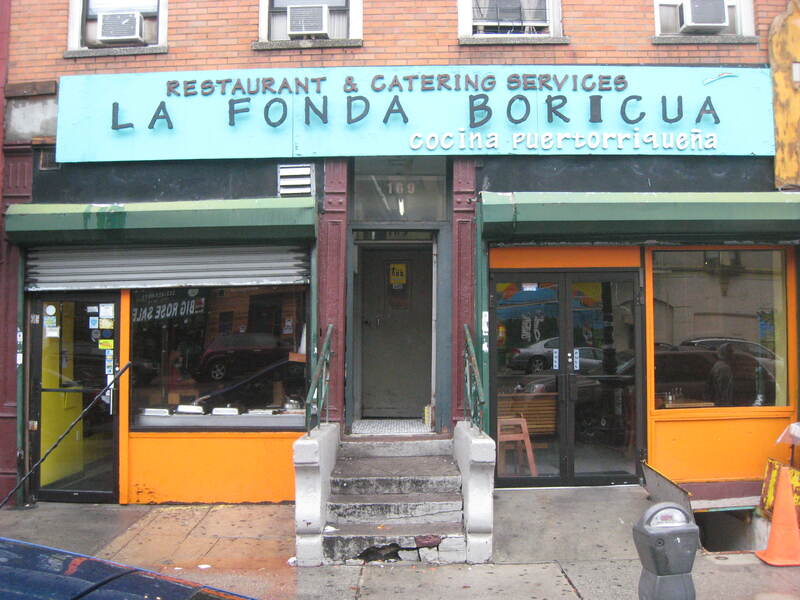 So here now is a very brief summery of the first restaurant our group visited in February of 2002, East Harlem’s, La Fonda Boricua. My wife commented, not too favorably, on the special “tostones” sauce at La Fonda Boricua. Of course she tasted it second hand. And with a flu-stuffed nose. To me that meant the sauce was a true success…as was the rest of the collective meal. Kudos must go to Rick for experimenting with the chivo (goat) and Gerry, a brave man to eat those chicken gizzards. He deserved that six-pack of Corona Light. I guess the liquor license did not apply to wine. But who’s complaining? At least they finally took our order. Charlie met the match and delivered with an authentic global eatery for under $20. . .including flan…vanilla only. The Ayala brothers, owners of La Fonda Boricua, are now interested in adding to the art on their wall. I hear they would like to contact the Puerto Rican artist who has scribbled the tiny portraits forming the thumbprint. What they are looking for now is a new theme; a portrait of Zio, in the shape of a big toe, which, coincidentally, resembles his physique, and a mountain of mofongo, slathered with brown gravy, in front of him. Since our visit, La Fonda Boricua has continued to thrive and was “discovered” by the Food Network and even involved in a “Throwdown” with chef Bobby Flay going up against the owners in a battle for the best arroz con pollo. But what has been good publicity for La Fonda would have the opposite effect on our group. A spot on television would have immediately eliminated the restaurant from our consideration. They now have an extensive website www.fondaboricua.com and have opened a sister lounge across the street with live Latin music called FB Lounge.